Contains aspirin USP for the temporary relief of pain, fever and inflammation associated with the symptoms of wounds, cuts, abrasions and soft tissue pain in horses. Also good for conditions associated with arthritis and joint pain. 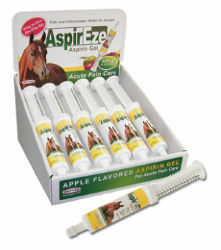 Advantages: For acute conditions such as cuts, bruises, muscular pain, and inflammation, Microencapsulated to enhance palatability and for ease of administration by horse owner, buffered for safety, Apple flavored, Precise dosage - extensive clinical trials to determine aspirin’s most effective dose for acute pain. Very effective - customers will see a difference within hours, Tested safe for use in pregnant mares and very old horses, Contains the most potent OTC drug that dealers are allowed to sell, Can also be used for chronic conditions, such as arthritis and lameness. For adult horses of 1000lb; give 20cc twice daily or as needed at or before feeding. Adjust amount given depending on the size of the horse and the desired results. Do not give more than a total of 80cc in any 24-hour period. For symptoms associated with arthritis, give 7cc twice daily or as often as needed.